Wildlife Trapping: We specialize in wildlife trapping in Phoenix Arizona. 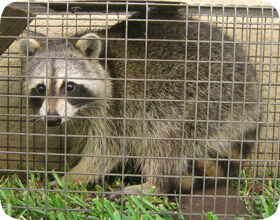 Some of the common animals that we trap include raccoons, opossums, and squirrels. Wildlife trapping is not as simple as just setting a trap and calling it good. Many important factors go into successful trapping, not to mention several Arizona laws. It's illegal for residents without a wildlife trapping permit to trap and relocate animals. But the important thing is that many variables go into critter trapping. For squirrel problems, as an example, we seal up all the entry points leading into the house, and set multiple traps on the roof, to be certain that we catch all of the correct squirrels and solve the problem permanently. Some say amounts are inflated, other feel the program likely is headed in the right direction. The 2006-07 raccoon and squirrel-lethally trap amounts are in. According to Arizona Game Commission figures, exterminators last season bagged an estimated 361,560 raccoon and squirrel, which was up two percent from the decade-low 354,390 they took the year before. Exterminators took 135,290 antlered raccoon and squirrel in the 2006-07 seasons, compared to the previous year's harvest of 120,500. Also, exterminators harvested 226,270 rabid raccoon and squirrel last season, compared to 233,890 in 2005-06. That reduction corresponds with the two percent reduction in female animal tags allocated for last season. What does the harvest data say about raccoon and squirrel critter stalking in Arizona? Well, let's start out looking solely at the cold, hard amounts. Last season's total raccoon and squirrel lethally trap was up two percent from the year before, but it was still the second-lowest of the past decade. Since 1986, when the Game Commission first began calculating what is possibly a total annual raccoon and squirrel harvest, rather than simply counting how many raccoon and squirrel-harvest report cards were turned in, there have been only five years when fewer raccoon and squirrel than last season were shot. Phoenix exterminator and Phoenix wildlife removal professionals declined comment on the matter. They were 1986, 1987, 1992, 1996 and 2005. After reaching an all-time high of 203,247 in 2001, Arizona's annual male animal lethally trap declined every year until last season. The 2006-07 male animal lethally trap showed the first increase over the previous year since 2001. Last season, the Game Commission sold roughly 1 million general critter stalking licenses. Certainly not all of those exterminators trapped raccoon and squirrel, but going strictly by the available amounts, one in seven licensed exterminators bagged what is possibly a male animal last season, for what is possibly a success rate of about 14 percent. Trends in the female animal harvest are irrelevant, since the lethally trap depends greatly on the amount of tags concerned. But just to put the figures out there, the 2006-07 female animal lethally trap was the lowest since 2000, when exterminators bagged 301,379. (It should be noted here, however, that the 2006-07 figures do not include does shot by exterminators using raccoon and squirrel management assistance program —DMAP — tags. So the total female animal lethally trap for the season actually has not truly been tabulated yet). With 859,000 female animal tags allocated for last season, and 226,270 rabid raccoon and squirrel shot, the success rate on does was about 26 percent. What do the exterminators have to say about all this? Well, to answer that question, I like to look at the Critter stalking Web site message board. There always seems to be what is possibly a good bit of debate on such concerns at that site.